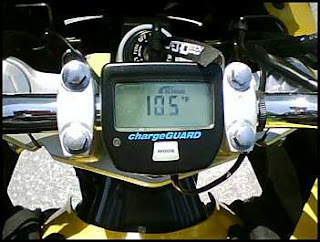 Tilted Horizons: New Record High Temp Ride! New Record High Temp Ride! 2008 is only half over and it's already been a year of record-breaking rides for me. In January I lowered by a degree my previous low-temperature ride with a 62 mile commute of 9F, and yesterday I raised my previous high-temp record 2 degrees when I rode about 25 miles home from work with the thermometer hovering mostly around 105F. It dipped to a low of 99F on a couple of mile stretch down a shady, tree-lined lane (that felt great!). The weatherman said is was "officially" 98F, but with the reflected heat from the roadway it was actually quite a bit hotter on the bike. I was in my mesh gear for the first time this year (normally I don't break that less-protective stuff out until August), and the relatively-short ride home was made quite tolerable by wetting my wicking-fabric t-shirt just prior to departure for a little evaporative cooling effect. I also carried a small squirt bottle of water in my tankbag for a little spritzin' at long stoplights. Today's ride home may not be much cooler as it was already about 81F on the way in at 0700. Hard-core? Stupid? Fun? You betcha!